trust me, lots more room here! Saturday night I was feeling inspired and productive by the upcoming new year and its goal. 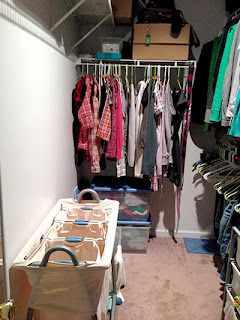 I decided it was time to tackle the closet and my clothes! Dun-dun-dunnnnn. This time no holding back. Time to be realistic! I got rid of clothes that would never fit again, clothes that never looked good on me to begin with and clothes I just never wore. In the end, I ended up with 3 garbage bags stuffed as stuffed could be. Yeah, I kept some clothes that may or may not fit, some that does hold sentimental value and some that is just too fun to throw away. But the majority are my classics, clothes that lasted through the years, clothes that look good on me and clothes that'll hold me over till I get back into shape. I also gave myself new rules to follow. Rules that I've been thinking about for years but never implemented. Now that I'm not pregnant anymore and working on getting into shape, there's no more excuses. My ultimate goal for these rules is to have a closet filled with good quality clothes, clothes that look good on me and give me confidence and clothes that all kind of go together for lots of mix and matching. I want a style, I want a look that really expresses who I am. Not the all over the place girl I've been. - Don't buy from stores you know that doesn't fit you properly or falls apart quickly. Places like Old Navy and Target. Time and time again I buy clothes from there, only for it to make me look dumpy. Not worth the lower prices. - Don't buy from Good Will. While I may have found some awesome clothes at Good Will, a lot of stuff I do buy is on silly whims, thinking I can totally pull off. The last few times I bought pants there ended up looking just bleh on me. - Don't buy clothes JUST because it's on sale. So many times I bought things that were on sale that looked ok on me and in a color that I normally don't wear. - Don't buy clothes in colors and patterns that you know don't look good. Lately I've been paying attention to what colors look best on me. Just because I'm a happy and bubbly person, pink is not my color. Pink is a nice accent on me. Neutral colors look best with pops of color. A grey shirt with a teal cardigan. - Don't buy clothes in styles that aren't you. I love vintage, but I can't pull it off. I can't pull off the business casual cute or the flowy bohemian. - Don't buy clothes that are not comfortable. That means too tight, weird cuts and fit. - Don't buy shirts from events and concerts. Mens shirts rarely fit good! Save the cash, keep the memories. I can't wait to see how all this hold up and how different my clothes and closet will be by the end of the next year. The closet looks great and your rules are SPOT ON. I am going to print this out and refer to it everytime I go shopping. So good! Thanks for sharing.